Shahzad, Z., Marquès, L., Berthomieu, P. and Gosti, F. (2015). An Assay to Test the Capacity of Arabidopsis Plant Defensin Type1 Protein to Induce Cellular Zinc (Zn) Tolerance in Yeast. Bio-protocol 5(22): e1653. DOI: 10.21769/BioProtoc.1653. Heterologous expression of genes in budding yeast Saccharomyces cerevisiae (S. cerevisiae) is especially suitable to functionally study the corresponding encoded protein at the cellular level (Bonneaud et al., 1991). This is mainly because many strains defective in specific activities are available and could be complemented by homologous genes existing across the eukaryotic kingdom (http://www.yeastgenome.org/). However, the protocol we describe here is not a complementation but a “gain-of-function” assay. It is based on a drop-test assay that we have set up to assess the cellular zinc tolerance conferred by the expression of heterologous genes in the wild-type S. cerevisiae. Different dilutions of a yeast culture expressing the heterologous gene of interest are grown on a range of zinc-enriched plates, and are then compared to the control yeast expressing the empty vector. Working with different concentrations of both yeast and zinc are essential to succeed in describing zinc tolerance phenotype upon yeast transformation (Mirouze et al., 2006). This test has also proven to be valuable to differentiate among related members of gene families as exemplified for Arabidopsis Plant Defensin type1 (Shahzad et al., 2013). Note: For each yeast clone to be analyzed. Use a sterile inoculating loop to inoculate each yeast clone to be tested in 20 ml liquid selective YNB media in sterile 250 ml glass Erlen flask. Note: At least three independent yeast clones are tested for each construct (harboring either recombinant or control plasmids). Culture yeast cells at 30 °C under 200 rpm agitation Over Night (O/N). Prepare Petri dish for drop assay. Prepare sterile selective YNB solid media containing the appropriate amino acids and appropriate zinc sulfate concentration to be tested. Under laminar flux hood, pour 50 ml of sterile selective YNB solid media in each square 12 cm x 12 cm Petri dish. Note: Tolerance to zinc excess is usually tested around the final concentrations of 23, 25, 27.5, 30 and 32.5 mM. The control condition is without zinc added (≈1.4 µM). The leucine and methionine auxotrophy are complemented by the addition of the corresponding amino acids to the final concentrations of 0.75 mM and 0.33 mM, respectively. Let media solidify, cover opened, for 15 min. Close and store square Petri dish under the hood. Prepare yeast for drop assay. Note: All subsequent manipulations with yeast are performed under sterile conditions in laminar flow hood. Transfer O/N yeast culture in sterile 50 ml Falcon tubes. Centrifuge for 5 min at 5,000 x g at room temperature. Suspend yeast culture with the same volume of sterile water (20 ml). Repeat steps 7 to 9. Measure optical density at 600 nm after suitable dilution (usually 1/10) to get an OD600nm of around 0.4. In a 1.5 ml sterile Eppendorf tube, make appropriate yeast culture dilution with sterile water in order to reach OD600nm of 1 in 500 µl volume and then make serial dilution in order to reach OD600nm of 10-1, 10-2, 10-3 in a maximum of 500 µl. Use a pipet and sterile filter tips to drop 10 µl of each yeast dilution onto selective YNB media supplemented with ZnSO4 at various final concentrations (see Figure 1). For steps 10 to 12: Yeast cells sediment particularly rapidly; hence make sure to fully agitate the yeast culture before taking a sample and / or before measuring optic density of a suspension and/or before drop assay. For drop assays, separate the center of each drop by ≈1 cm. Allow drops to dry under the laminar flux hood. Close Petri dish and wrap them plastic foil (type Saran Wrap). Incubate in 30 °C incubator upside down. Monitor yeast growth every day and record results by scanning the Petri dish under black screen at a 600 dots per inch (dpi) resolution (usually less than one minute per scan). For each zinc concentration, the yeast expressing the protein of interest is compared to the yeast harboring the empty pYX212. Note: Control plates, i.e., without zinc added, are usually read 2 days after incubation. This is necessary to verify that the expression of the protein of interest does not disturb yeast growth at very low zinc concentration. Plates for zinc tolerance assay (upon zinc addition) are usually read between 4 to 7 days after incubation. Figure 1. In vitro functional characterisation of amino-acid substitutions impacting zinc tolerance capability in AhPDF1.4 and AtPDF1.4. Serial dilutions of the S. cerevisiae BY4741 strain expressing the pYX212 empty vector (EV) or pYX212 harbouring AhPDF1.4, AtPDF1.4 or its mutated versions of were analysed. Replacement of either A28 to G (A28G) or S54 to R (S54R) or both (A28G- S54R) were generated. 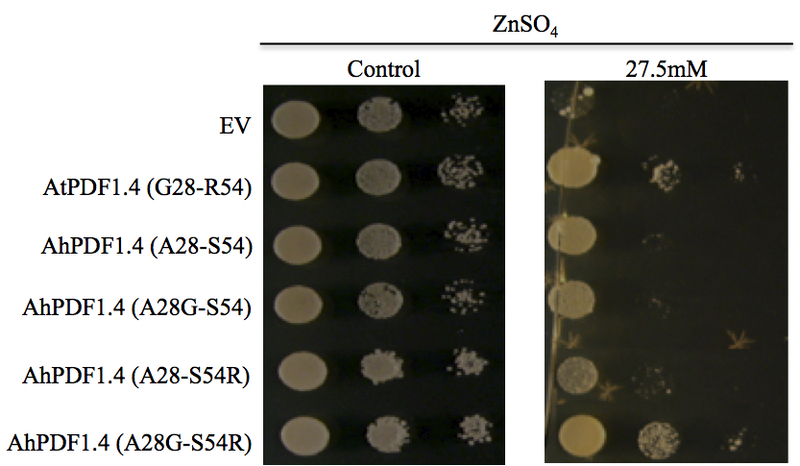 The various yeast transformants were spotted on medium supplemented with 1.4 µM (control), or 27.5 mM ZnSO4, as indicated above the panels. Each spot was made with 10 µl of a yeast culture diluted at the OD600nm mentioned below the drops. Pictures were taken at day 2 for control and day 11 for the Zn treatments; they are representative of the three experiments, which have been performed with three independent yeast transformants. Reproduced from (Shahzad et al., 2013; Supplementary Figure 4). The BY4741 S. cerevisiae strain has auxotrophic markers, in particular for the production of the amino acid histidine (his3∆1). Free histidine is a potent metal chelator and could, in particular, chelate zinc if this metal is present in the culture medium. The histidine (his3∆1) auxotrophy must thus be complemented by the expression of the corresponding HIS gene (here expressed from the pFL38 plasmid) and not by the addition of free histidine, which would bias the zinc tolerance test. Upon cooling of solid media, add necessary sterile amino acid solutions complementing auxotrophy (here leucine and methionine) and sterile zinc in order to reach concentrations that will be tested. Note: Care should be taken to add necessary sterile amino acid solutions and sterile zinc when solid media has cooled down to ~ 40 to 45 °C. This will prevent both the degradation of added amino acids and the precipitation of the metal. This work was supported by the University of Montpellier (LM), the French Ministère de l’Enseignement Supérieur et de la Recherche (PB), the Pakistani Higher Education Commission (ZS) and the Centre National de la Recherche Scientifique (FG). Bonneaud, N., Ozier-Kalogeropoulos, O., Li, G. Y., Labouesse, M., Minvielle-Sebastia, L. and Lacroute, F. (1991). A family of low and high copy replicative, integrative and single-stranded S. cerevisiae/E. coli shuttle vectors. Yeast 7(6): 609-615. Brachmann, C. B., Davies, A., Cost, G. J., Caputo, E., Li, J., Hieter, P. and Boeke, J. D. (1998). Designer deletion strains derived from Saccharomyces cerevisiae S288C: a useful set of strains and plasmids for PCR-mediated gene disruption and other applications. Yeast 14(2): 115-132. Mirouze, M., Sels, J., Richard, O., Czernic, P., Loubet, S., Jacquier, A., Francois, I. E., Cammue, B. P., Lebrun, M., Berthomieu, P. and Marquès, L. (2006). A putative novel role for plant defensins: a defensin from the zinc hyper-accumulating plant, Arabidopsis halleri, confers zinc tolerance. Plant J 47(3): 329-342. Shahzad, Z., Ranwez, V., Fizames, C., Marquès, L., Le Martret, B., Alassimone, J., Gode, C., Lacombe, E., Castillo, T., Saumitou-Laprade, P., Berthomieu, P. and Gosti, F. (2013). Plant Defensin type 1 (PDF1): protein promiscuity and expression variation within the Arabidopsis genus shed light on zinc tolerance acquisition in Arabidopsis halleri. New Phytol 200(3): 820-833. Winston, F., Dollard, C. and Ricupero-Hovasse, S. L. (1995). Construction of a set of convenient Saccharomyces cerevisiae strains that are isogenic to S288C. Yeast 11(1): 53-55. How to cite: Shahzad, Z., Marquès, L., Berthomieu, P. and Gosti, F. (2015). An Assay to Test the Capacity of Arabidopsis Plant Defensin Type1 Protein to Induce Cellular Zinc (Zn) Tolerance in Yeast. Bio-protocol 5(22): e1653. DOI: 10.21769/BioProtoc.1653.